MASTER-SEAL Epoxy Putty CompoundMASTER-SEAL Epoxy Putty Compound is two component room temperature curing, easy to use multi-purpose epoxy putty. It is useful in sealing, fixing, joining, building, insulating variety of surfaces like ferrous and non-ferrous metals, porcelain, ceramic, marble, concrete, granite, asbestos, glass, wood, certain plastics, etc. 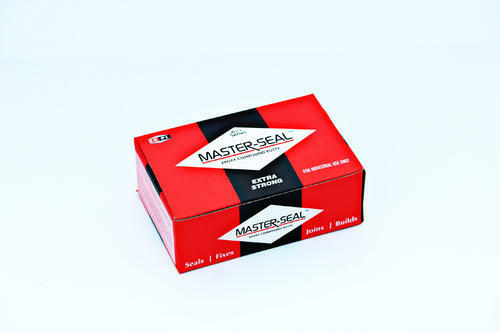 MASTER-SEAL Epoxy Putty Compound is two component room temperature curing, easy to use multi-purpose epoxy putty. It is useful in sealing, fixing, joining, building, insulating variety of surfaces like ferrous and non-ferrous metals, porcelain, ceramic, marble, concrete, granite, asbestos, glass, wood, certain plastics, etc. On curing, the compound sets into a hard mass that can be drilled, tapped, machined, cut and then painted. It has a good electrical insulating properties and the cured product is resistant to moisture, heat, mild acids and alkali. It is ideal for industrial, electrical, automotive, grouting civil cracks, general household, and handicraft applications. Resin and hardener components are equally mixed with both hands by rolling between two palms until a dark gray colour (like dried cement mortar) is attained. MASTER-SEAL General Purpose once mixed sets within 35 minutes. Packaging Details As per ordered packing. Esquire Chemical P Industries was established in the year 1992. We are leading Manufacturer, Exporter, Supplier of Master Seal Epoxy Putty, Micro Steel Epoxy Stick etc. For streamlining diversified work our firm is divided into various units. Our various units are maintained in proper running conditions for excellent production activities. Administrative department take complete notice of working of the firm and assists in carrying out changes in functional structure.